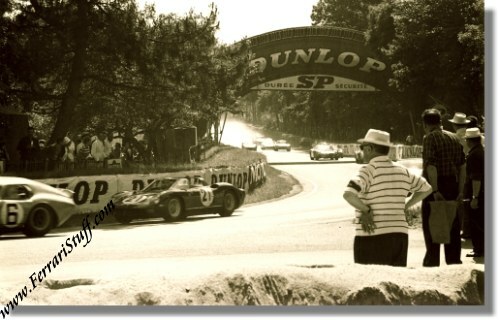 This is a vintage photo taken during the 1964 running of the Le mans 24 hours, showing the Ferrari 330 P S/N 0820 of Ludovico Scarfiotti and Mike Parkes. The car was a Scuderia Ferrari factory entry and would drop out of the race in lap 71 due to oilpump problems. The car, S/N 0820 now seems to reside in the USA. The photo measures approximately 25 x 16.5 cm or 9.75 x 6.5 inches. It carries the stamp of master photographer Geoffrey Goddard on the back.